If you are among the 19 million people Apple predicts will buy an Apple Watch, I have some bad news for you — I’m betting there is an important feature missing from the watch that’s going to drive you nuts. That doesn’t mean you shouldn’t buy one. In fact, I’m ordering one myself. However, this paradox illustrates an important lesson for the way companies design their products. To find out why you’ll likely be disappointed by the Apple Watch, meet Professor Noriaki Kano. In the 1980s Professor Kano developed a model to explain a theory of customer satisfaction. Kano believes products have particular attributes, which are directly responsible for users’ happiness. He discovered that some qualities matter more than others. Kano describes three product attribute types (loosely translated from Japanese as): delightful, linear and hygienic features. A delightful feature is an attribute of a product that customers love but do not expect. For example, if the Apple Watch made you coffee every morning, that would be a delightfully surprising feature. A linear feature, on the other hand, is one users expect. More of that quality increases satisfaction. Battery life is an example of a linear feature of the Apple Watch. You trust that it will last all day but the more juice the battery has, the less you need to charge it and the happier you are. Customers are typically able to articulate the linear attributes of a product (“I want it to have long battery life”) whereas by definition they can’t tell they want a delightful feature until they’ve seen it in action. Like knowing the punchline of a joke: If you know what to expect it fails to delight. Finally, hygienic or “basic” features are must-haves. Customers not only expect these attributes, but they depend on them. If the Apple Watch is bad at telling time, for example, you would undoubtedly be very ticked (tocked) off. Ellen DeGeneres tweeted a sardonic comment that perfectly demonstrates what happens when we make a basic feature sound like a delighter. Joking aside, Apple CEO Tim Cook knows just how important telling time is for an expensive timepiece. Cook emphasizes that the device is accurate within 50 milliseconds. In addition, when the battery is almost depleted, the watch kicks into “Power Reserve” mode, shutting down everything but the ability to see the time. Obviously, Apple understands telling time is a hygienic feature. However, when it comes to this basic feature, something is still missing. This brings me to what will likely annoy you about the Apple Watch. A basic attribute of any watch is that it allows wearers to see the time all the time. With a regular watch, checking the time couldn’t be easier. You only need to glance down to know what time it is — not so with the Apple Watch. if telling the time on your Apple Watch requires a spastic wrist jolt, you’ll curse it. Who hasn’t sat across from an overly gabby colleague wondering whether you’ll be late to your next meeting? If we’ve bothered to wear a watch, we expect to be able to see the time at a glance. But if telling the time on your Apple Watch requires a spastic wrist jolt, you’ll curse it. The problem is significant enough that other smartwatch makers already see Apple’s failing as an opportunity. The recently announced Pebble Time, for example, uses a low-power color e-paper display and never goes dark. Of course, all this doesn’t mean you’re not going to buy the watch. Apple may very well make the wake feature so sensitive that few people are troubled by it. After all, even an obvious wrist shake is better than the inconvenience of checking the time by taking out your phone. However, greater turn-on sensitivity will come at the expense of battery life, a compromise consumers aren’t going to be happy about. To avoid disappointment, keep your expectations low and be prepared to miss some basic features you’d expect from even a cheap watch. Remember, the iPhone had its problems in the beginning. Apple’s choice of AT&T as the exclusive service provider for the first few generations of the iPhone meant more dropped calls and poor reception. The device was often loathed for its inability to deliver the basic Kano feature customers expected most from a phone — namely, to complete a call. Over time, the technology improved, but why did people put up with these seemingly fatal flaws for so long? 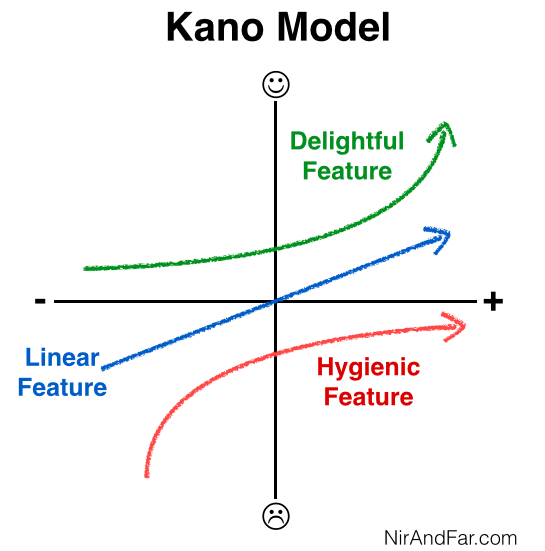 Here again, the Kano model helps us better understand the mindset of consumers. People kept using (and often praising) the iPhone because the delight factor made up for its lack of basic attributes. Mainly, Apple‘s App Store and its near infinite variety of nifty solutions provide a constant stream of delightful features even Steve Jobs could never have imagined. The iPhone still doesn’t make coffee, but it does so many other surprising things you didn’t know it could do when you bought it (from checking your heart beat to identifying constellations) that you overlook its flaws. To avoid disappointment, keep your expectations low. As for the Apple Watch, over time Apple will no doubt fix quirks in the first generation just as it did in subsequent iPhone editions. Ultimately, better battery life or alternative screens will keep future versions lit throughout the day. But the real delighter behind the Apple Watch, like the iPhone, will be the apps. Cook recently sent an email to Apple employees announcing that more than 1,000 apps have already been submitted. Expect future generations of the Apple Watch to have more delightful features customers currently don’t expect. My money on the Apple Watch 2 including a forward-facing camera, which wearers will discover makes taking pictures even easier and faster than using their phones. And it adds an element of delight every time they take a surprisingly good shot. We have a love-hate relationship with technology, and the Apple Watch will be no exception. By applying Kano’s model, companies can overcome the unavoidable deficiencies that come with new products by building-in features that continue to surprise and impress.